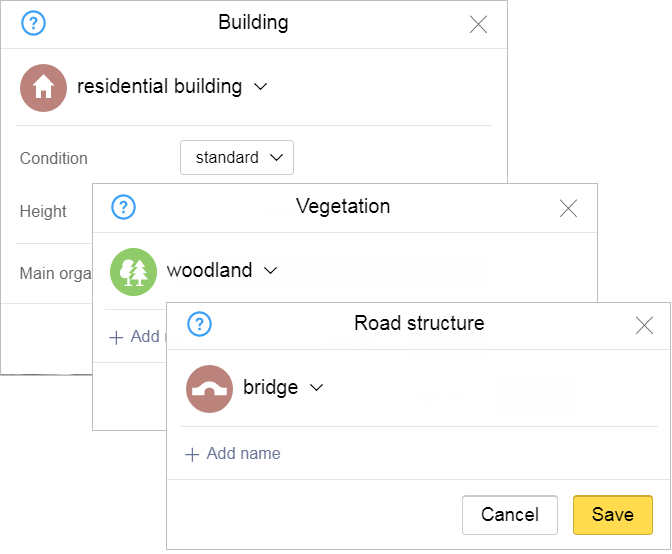 For every item on the map, you not only have to draw it, but also assign it attributes (i.e. enter values for its characteristics. A heading that displays the name of the item type (for example, “Building” or “Railway station”). A (Help) button, where you can read the rules for drawing that type of item and a (Close) button, which closes the panel without saving your changes. A set of fields where you can enter attribute values. 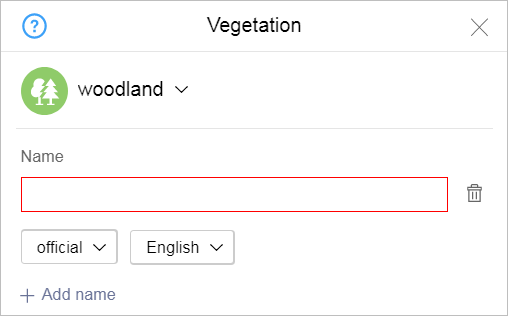 The fields in the attribute panels will differ based on the type of item. The list may include pictographs of map items. 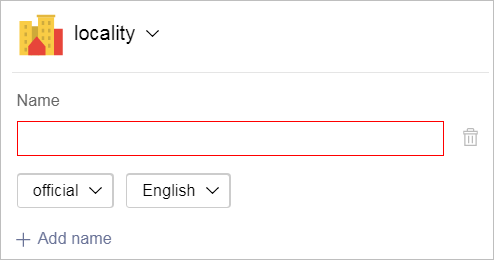 Click on the field to check or uncheck the box. The Save button, which saves your changes, and the Cancel button, which cancels any changes you made. The Name field group is part of the attribute panel for all items. Not all geographical items have names (for example many forests lack names). In these cases, you can leave the “Name” field blank. If the item has several types of names, then you must repeat this procedure after you enter the first name. 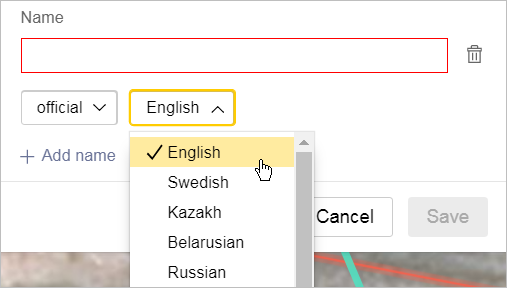 Just click on Add name and enter the type and language for the next name in the new field group. When you add several types of names, keep in mind that they should all refer to the same map item. For example, for Leninsky Ave. in Moscow you can enter the name Bolshaya Kaluzhskaya St. (the “Also known as, historical” name type). 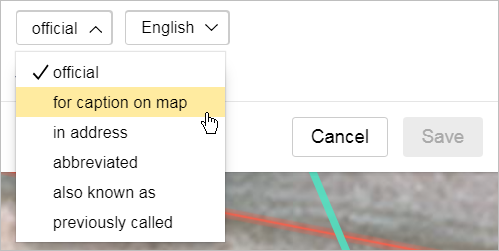 If you are referring to different items (such as roads that partially overlap), then you should add two different items to the map rather than add the names for both of them to one item. For example, Minskoe Highway and the M-1 route partially overlap, but they are mapped as two roads rather than two names for the same road. 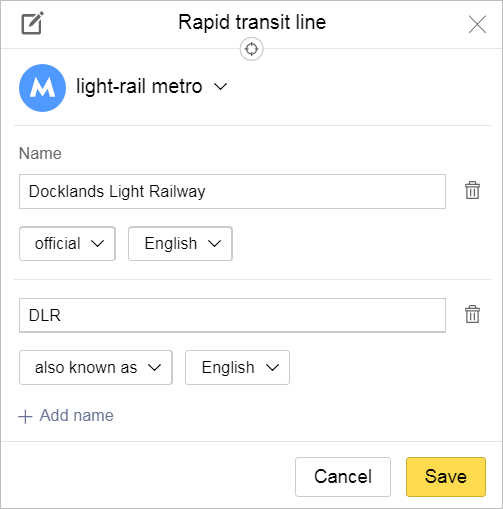 If you need to delete one of the names, click (Delete) to the right of the “Name” area. The corresponding field group will be deleted. Click Save on the panel. The names you entered will be saved.